With the invention of the laser in 1960, the proverbial quantum mechanic had his first tool: a coherent photon source. Since then, the laser has provided us with an astounding number of technologies and applications. Two short years later, in 1962, man had his first accurate measurement of the distance to the Moon thanks to the laser. Ten years after that, we began to see everyday uses in devices such as bar-code scanners, optical disk players, and eye surgeries. In 1997, the Nobel Prize was awarded for a new application of the laser, the Magneto-Optical Trap (MOT). The principal mechanism of a MOT is the laser-cooling of atoms. During laser-cooling, one transfers the momentum of the atoms to the incident photons. Even though the relative momentum of the photon is small compared to the atom, the process is repeated and repeated, as even meager lasers produce 10^15 photons per second (see http://www.colorado.edu/physics/2000/bec/lascool1.html for a nifty demonstration) and mK temperatures are routinely achieved in less than a second. These extreme temperatures now allow access to timescales over which we can repeatedly probe the sample’s quantum state. Hence the laser has given the quantum mechanic a second tool: a coherent atom source. By controlling and manipulating the internal, quantum states of matter, one has an extraordinary amount of control over such systems, giving rise to a number of real-world applications. One of the most successful applications of cold-atom sources has been the development of atomic clocks. Small, portable frequency standards, are a key cog in GPS technology. 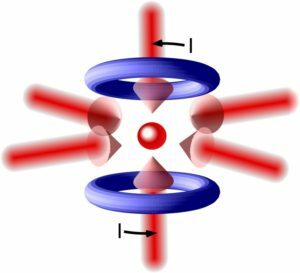 Due to the delicate nature of the quantum states, ultra-cold atoms make for incredibly precise sensors as well. The need to navigate in GPS denied environments has spurned a race to use cold-atom sources as inertial sensors, which could offer orders of magnitude improvement in sensitivity over the current technology. In addition, people are using the sensitive nature of cold-atoms to approach new frontiers in gravitometry and magnetometry. MOTs also have applications in nano-fabrication as a source for focused ion beams, or ultrasensitive trace-isotope analysis. Quantum computing harnesses the extremely long interrogation times afforded to species such as trapped ions and Rydberg atoms to make the many rounds of error correction and processing necessary for quantum computations. Quantum computers are uniquely equipped to perform the complex algorithms of cryptography and simulation of quantum systems. In 1995, researchers (including Vescent’s own Mike Anderson) created the first Bose-Einstein condensate, the newest addition to the quantum mechanical toolbox. 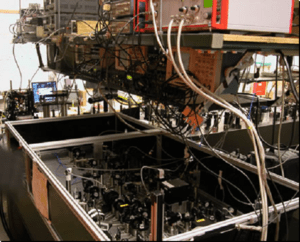 By taking additional cooling steps beyond the conventional laser cooling in a MOT, researchers were able to cool a gas of atoms to the fundamental quantum limit, billionths of a degree above absolute zero. At these temperatures the gas undergoes a phase transition where the atoms “condense” to the ground state of the system. In this condensed state the individual nature of the constituent atoms gives way to a global coherence shared by the bulk. Armed now with a macroscopic wavefunction, scientists use these systems to mimic more complicated quantum systems, and are currently underway in developing applications for the field. All of the applications above share the need for agile laser sources and varying levels of control. Typically seen in most scientific labs is the “forest of optics” which includes everything from frequency agile lasers and opto-electronics to mechanical shutters and motorized mirror mounts. Where as in years past these sorts of systems would take up entire optics tables, Vescent has been able to shrink these optical systems a fraction of that, leaving space for what’s really important: science. With a larger toolbox, the future of quantum mechanics applications appears bright. Our philosophy of mechanical laser stability, electronic agility, and innovation in electro-optics is driven by our belief that what is on the optics table today will be in the field tomorrow.